She is a two-time New York Times bestselling author. She has had her essays published in several reputable literary magazines. Her ideas on being an African-American have touched lives throughout the United States. 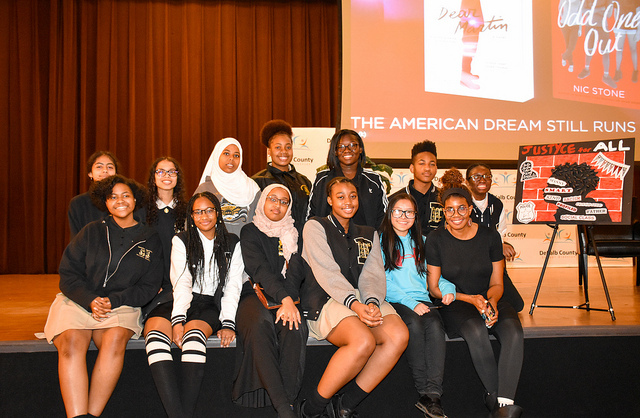 On Friday, March 15, 2019 bestselling author Nic Stone shared words of wisdom with an auditorium filled with DeKalb County School District (DCSD) students. Stone visited to speak with students from DeKalb Early College Academy (DECA). 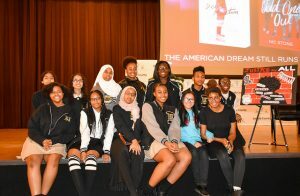 Her works, which include the young adult novels Dear Martin and Odd One Out, have received critical acclaim and appeared on the Helen Ruffin Reading Bowl book list. 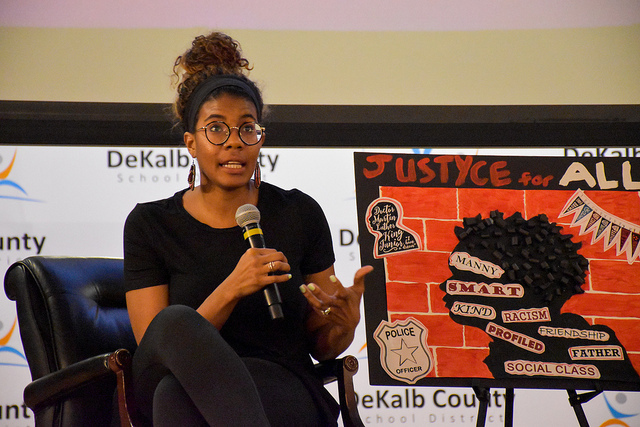 Dear Martin is centered around Justyce McAllister, an intelligent Ivy League-bound African-American student who becomes the victim of race-based violence at the hands of a police officer. As a way of coping, he writes letters to Dr. Martin Luther King, Jr. Odd One Out follows a group of high school friends as they navigate the world of friendships, new crushes and self-discovery. The story includes Courtney, a recently “dumped” girl, Rae, a new girl in school, and Jupiter, who has also recently ended a relationship. Both works have been praised for their social awareness and relatability by such publications as Bustle, The Atlanta Journal-Constitution, The Atlantic and The New York Times. Stone sat on stage with two DECA students who fielded questions from the gathered audience, which included teachers and staff members. Questions ranged from Stone’s overall writing process to how she established herself—as well as her unique voice—in the literary world, to motivations behind certain character decisions. For example, certain students were curious why Justyce McAllister chose to pursue academics instead of arts, sports, and entertainment. Stone explained that her ideas can come from anywhere, but once she finds an idea, she tends to latch on to it. Her latest idea, which centers around a group of black female slaves taking over a ship and becoming pirates, came from her time spent in Savannah. Following the conception of an idea, Stone said she will buy a composition notebook and jot down anything that comes to mind relating to that idea. Character names, dialogue, plot points, and other instances will be put to paper until she feels there’s enough for a general outline, which will also be included. From there, a first draft will be born. Stone encouraged students to let themselves fail, to let their first works stand as building blocks for future, better works. She admits that her own first work stands as a piece of strangeness that remains a mystery. Her second book, similarly, took time to be perfected and will not be published until 2021. Dear Martin, her most successful work so far, even arrived after a publisher saw promise in Stone’s work, but wanted something different. She had 12 hours and three chapters to convince her would-be employers and ultimately proved she was up to the challenge. According to Stone, any student is just as capable. She upped the ante by promising $100 to any student to her favorite piece of work written by a DECA student that is published in a local literary magazine. Stone cited Jeffrey Eugenides’ The Virgin Suicides as her favorite book because, despite being about five Caucasian sisters, it was the first she can remember relating to. She also enjoyed reading about Tom Robinson in To Kill a Mockingbird, Jim in The Adventures of Huckleberry Finn, and Crooks in Of Mice and Men. Favorite contemporary authors that Stone recommended are Elizabeth Acevedo, Jason Reynolds, Andrew Smith and Neal Shusterman. Above all else, Stone simply encouraged students to read, and read voraciously. DECA students surprised Stone with a $250 donation to Lost-n-Found Youth, a 501c3 dedicated to helping homeless LGBTQ youth.